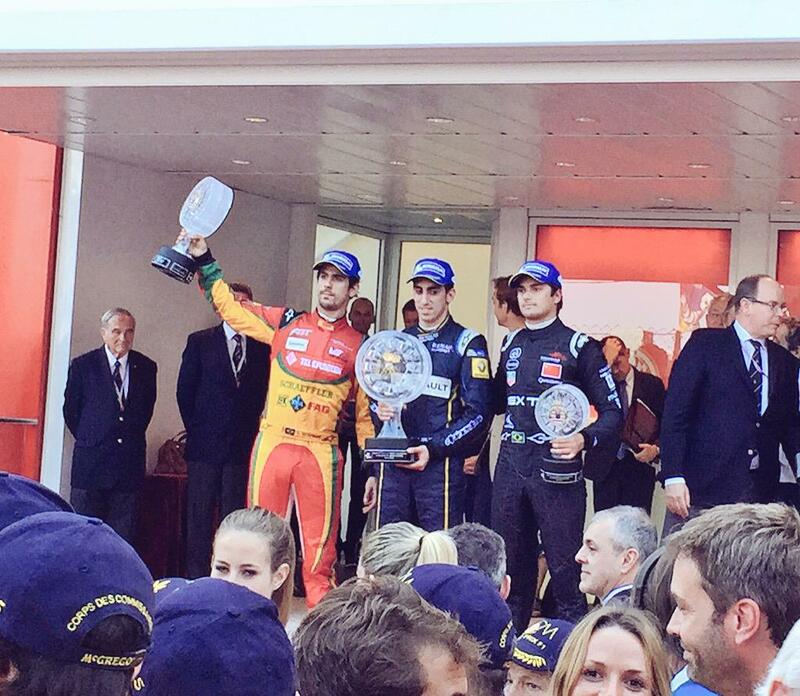 Sebastien Buemi has won the 2015 Monaco ePrix and as a result has become the first double winner in the series’ first year. Buemi took off after qualifying on pole to take the lead into turn one. Lucas di Grassi and Nelson Piquet took the remaining spots on the podium, with a number of drivers having had their chances dashed after a massive lap 1 crash involving Bruno Senna and Daniel Abt. Sebastien Buemi took pole position in the group qualifying session earlier on in the day, and with Monaco historically favouring the pole-sitter; Sebastien’s performance was crucial. Championship leaders Lucas di Grassi and Nelson Piquet Jr were on bad terms heading into the race, with Piquet angry after Di Grassi impeded him during his qualifying lap. Buemi made a fantastic start as he capitalized on his pole position to vault into the lead. Di Grassi and D’Ambrosio slotted in behind as Bruno Senna attempted to make gains up the inside into the tighter variant of Sainte Devote. Soon, the importance of pole position became apparent, as Daniel Abt tagged the wall and the short chute down to turn 2. The slow Audi Sport ABT car caught out Bruno Senna who flew over the rear wheels of Abt’s car. The Mahindra just about stayed upright, but the rest of the field piled in behind; with Liuzzi, Duran, Vergne, Pic, Da Costa, Heidfeld, Duval and more sustaining damage to either their wheels or front wings. A couple of laps were taken to clear stricken cars or debris, but the race was back under-way at the start of lap 4, with Buemi bolting away in the lead once more. Nelson Piquet Jr had been one of the victors in the FanBoost vote and was keen to use it on the track where overtaking is nigh on impossible. He deployed the boost on the start/finish straight to try and put himself in a position to pass Jerome D’Ambrosio, but he couldn’t get by at Turn 1. He tucked back in behind the Dragon Racing car as they went down the hill toward turn 2, before a decisive lunge up the inside put Piquet into 3rd place behind fellow country-man and rival Di Grassi. Over the course of the next few laps, Piquet started to not only save energy, but manage to start drawing in closer to the leading duo. By lap 20, Piquet had impressively cut the 2 and a half second gap, whilst still only have 1% less energy than Buemi and Di Grassi. Di Grassi pealed into the pits on lap 24 with 10% left in his Audi Sport ABT car. The Brazilian had come in a lap early in the hopes of achieving an under-cut on Buemi; whom he had been stuck behind all race. Buemi and Piquet stayed out 2 more laps before peeling into the pits, with Buemi emerging millimetres ahead of Di Grassi. Lucas tried a move into the Harbour chicane, but Buemi just managed to hold the Audi Sport ABT car behind him on the inside. Britain’s Sam Bird had been one of the only people to gain from the massive lap 1 crash, with the Virgin Racing driver now up to 4th place and right on the back of Piquet for third with 17 laps to go. Piquet soon started to stretch his legs again however, with the Brazilian soon closing back up to 2nd placed Di Grassi. Piquet used his FanBoost with less than 10 laps to go as the pair came down the start/finish straight, but the move didn’t materialise. Piquet almost ran into the back of Di Grassi down into the Harbour Hairpin, but somehow managed to avoid damage. Back at the front however, Buemi had benefited from Di Grassi and Piquet’s battles to get a good lead going onto the final lap. His only challenge on lap 47 was one more lap and a back-marker. Buemi managed to negotiate both of these to become the first multiple winner this season and the winner of the Monaco ePrix. Lucas di Grassi held off his fellow country-man Nelson Piquet Jr for 2nd place; with Piquet’s challenge fading after his near-miss with the rear of Di Grassi. Sam Bird’s run of bad luck ended with a great 4th place finish for Virgin ahead of Nicolas Prost; who was struggling for pace at the end of the ePrix. Stephane Sarrazin took 7th at Venturi’s home race, with Scott Speed coming back from sustaining front wing damage on lap 1 to take 8th. Charles Pic and Antonio Felix da Costa had also been involved in the lap 1 crash, but the pair were able to fight back to take the final two points paying positions. Jean-Eric Vergne’s first car had been badly damaged on lap 1, but the Frenchman took to the track in his second Andretti Autosport car later on in the race to try and take the points for fastest lap with FanBoost; which he duly did. A 55.157 was a few tenths quicker than his nearest challenger, which gained him two points despite finishing in 15th. Buemi’s win means that he is now closing in slightly on championship leader Lucas Di Grassi, who has a 4 point lead over Nelson Piquet Jr.
P = 3 points for fastest time in qualifying. FL = 1 point for fastest lap in race. FB = FanBoost winners.